Its Monday kids and I'm doing another link up party for the Dog Days (of Winter) Are Over. Most of us are recovering from the food fest that is a Super Bowl Party. The particular party that I attend every year is called the "Weigh In, Weight Out" Party. Several attendees (mostly of the male species) compete to see who can gain the most weight during the game. This year was the 10th anniversary of the party. Its not a simple pig out fest either - there are several rules regarding liquid restrictions and some interesting strategy that takes place. And, of course, there is a trophy. I have been reluctantly displaying showcasing this trophy for the last two years as my husband is the reigning champion. But my days of trophy dusting are over as a new champion was crowned with a gain of 10.2 lbs. Congrats to Jack. This party holds a particularly special place in my heart - 4 years ago at this very party I met my husband for the first time. It was a set up that I knew about (my sister in law had been trying to get me to meet Andrew for several months) but he didn't. We met, chatted, he Facebook friended me when he got home that night and 6 months later we were engaged. I was telling Andrew on the way to the party that 4 years ago I was all "dressed up" in my awesome designer jeans and carefully selected jewelry trying to pull off the "I just threw this on but it really took days of careful planning and I'm hot" look while this year I changed into sweats because my non maternity jeans that I'm forcing myself to wear were just too uncomfortable. And I might have also been covered in baby drool. What a difference 4 years and a baby makes. Anyway, for today's Love It link up party, I made a treat that I originally saw on Pinterest - Rice Krispy Treat Kisses. These are super cute and fun and would be a very cute idea for a kids classroom Valentines Day party. Maybe I could take them to parent baby class - its the closest thing I have to such and event. 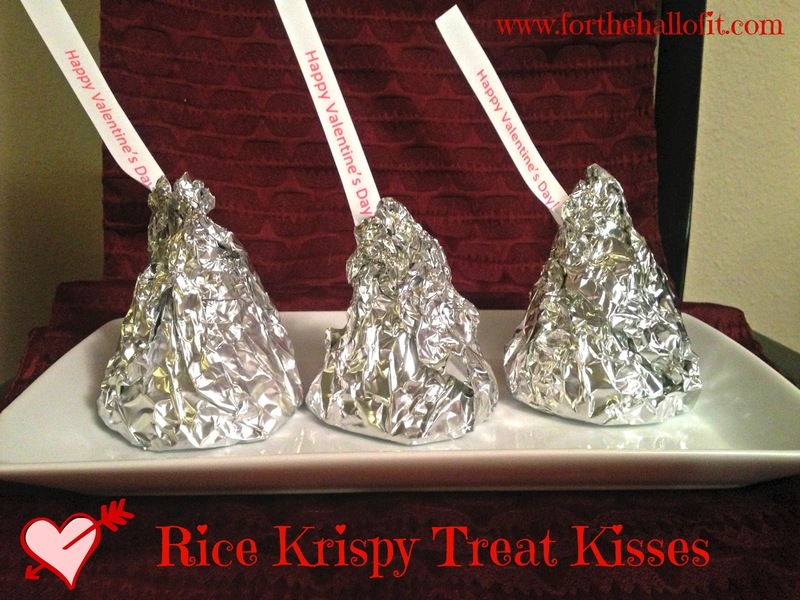 Its simple, all you need are your Rice Krispy Treat ingredients, a funnel, and some tin foil. Make your treats, let them cool slightly, press mixture into a funnel sprayed with cooking spray, let cool further on a pan and wrap in tin foil. I also printed out some little paper strips to say Happy Valentine's Day in a Word document on the computer. If you like this project, please pin it! Also, check out some of the other blogs that are involved in the link up party - I Love You More Than Carrots, House of Rose, The Francis Family and others. If you go to one you can see all the other projects. Good Stuff.